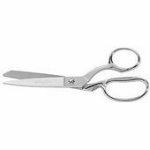 These Dressmakers Shears have blunt points to prevent snags on sheer fabrics, making them perfect for cutting silk. The serrated edge gently grips fabrics, so the knife edge can flawlessly cut through multiple layers of fabric all the way to the points. The bent handle allows for smooth, comfortable cutting across a tabletop or counter. Durable doubleplated chrome over nickel finish. Includes a fitted sheath and tin for storage.